What is hematuria? Hematuria is the passage of red blood cell in the urine. The causes of hematuria are commonly based on the anatomical position of organs of the urinary tract. Hematuria may occur due to disorder of the urethra such as due to stone, trauma, neoplasm or urethritis. Trauma to the bladder, bladder stones, carcinoma of the bladder and inflammation of the bladder (schistosomiasis, TB or cystitis ) may also lead to hematuria. Hematuria may also occur due to the impact of stone at the ureter or neoplasm of the ureter. Prostate cancer and benign prostatic hypertrophy are associated with prostate induced hematuria. Kidney disorders may lead to hematuria. The common kidney disorders are vascular malformation, embolism, stone, carcinoma, glomerular disease, polycystic kidney disease, trauma, renal vein thrombosis and tuberculosis. Other causes of hematuria are sickle cell disease, malaria, hemophilia, anticoagulant therapy, strenuous exercise and thrombocytopenia. There are other conditions that may mimic hematuria. These conditions are intake of senna, rifamipicin, phenolphthalein, beetroot, myoglobinuria, hemoglobinuria and acute intermittent porphyria. In terms of symptoms , patient may complain of painless hematuria, painful hematuria, initial hematuria and terminal hematuria. Painless hematuria is associated with tuberculosis and malignancy which require further assessment. Infection and inflammation are associated with painful hematuria. Bleeding of the bladder or urinary tract is highly suggestive of total hematuria. Prostate or bladder bleeding is suggestive of terminal hematuria. Patient may have recent travel history to TB endemic area or Schistomiasis. Patient also complaint of pain in the suprapubic region, dysuria and frequency due to disease of the bladder. Ureteric stone or blood clot is suggestive by ureteric colic and loin pain is due to disease of the kidney. Patient may also complain of family history of polycystic kidney disease. Acute intermittent porphyria is a rare condition. Patient who suffer from acute intermittent porphyria may complain of abdominal pain and urine which later turn to purplish red as it stand in the light. Patient anticoagulant medication status need to be checked. In certain cases, patient may suffer from falling astride an object or fracture of the pelvis which lead to urethral injury. Symptoms of prostatism such as nocturia, poor stream or difficulty in starting to urinate are suggestive of prostatism. Evaluate the intake of any substances/drugs which cause the changes in the color of the urine. Ischemia of the muscle or crush injuries may lead to myoglobinuria. Hemolysis is associated with hemoglobinuria . History of malaria, blood dyscrasia and sickle cell disease are also vital in identifying the causes of hematuria. Hematuria may also be associated with strenuous exercise. In term of signs, hard craggy prostate due to prostate carcinoma and smooth large prostate due to benign prostatic hypertrophy are common findings while performing digital rectal examination. Hypernephroma or bladder distention are common findings on abdominal examination. Chest examination is performed to identify any signs of tuberculosis or secondary metastases of kidney cancer. Patient may also present with signs of chronic renal failure , anemia or weight loss. Localized bone tenderness are common findings of hypernephroma or prostate carcinoma. Dipstick testing of hematuria should be confirmed with microscopic examination of the mid stream urine. The investigations required are full blood count, urea and electrolytes, urine microscopy, ESR, chest x ray, KUB scan, clotting screen, cystoscopy, CT scan, US scan, IVU, sickling test, PSA, prostatic biopsy, bladder biopsy, ureteroscopy and selective renal angiography. Full blood count may reveal raise white cell count due to infection. Reduced in platelets are associated with blood dyscrasia. Raised hemoglobin is due to hypernephroma associated with polycythemia. Low hemoglobin level is due to malignancy and gross hematuria. Urea and electrolytes are useful to rule out renal failure. ESR is elevated in tuberculosis and malignancy. Urine microscopy studies may reveal the present of white cells in infection and red cells. 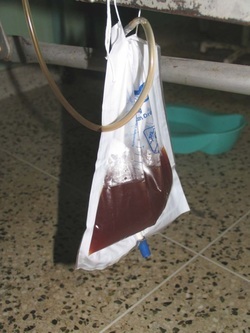 It is vital to differentiate hemoglobinuira and substances causing discoloration of the urine. Cytological studies are also important. Chest x ray may reveal the present of tuberculosis and cannonball metastases associated with hypernephroma. KUB scan is useful to detect renal stones. Clotting screen is considered in patient with blood dyscrasia or on anticoagulant therapy. Cystoscopy is considered for identification of stones, tumor or infection. CT scan is useful for staging the tumor and identifying the degree of invasion. Obstructive uropathy and cyst are also detected with CT scan. IVU is consider to evaluate the present of tumor, stones or TB. US is consider to look for any urinary tract obstruction, stones or to differentiate between solid or cystic lesions. Sickling test is use for sickle cell disease. PSA is useful for detecting prostatic carcinoma. Prostatic carcinoma can also be detected with prostate biopsy. Bladder biopsy is considered for tumor detection or diagnosing glomerular disease . Obstruction and tumor can also be detected with ureteroscopy. Tumor and vascular malformation can be detected with selective renal angiography.